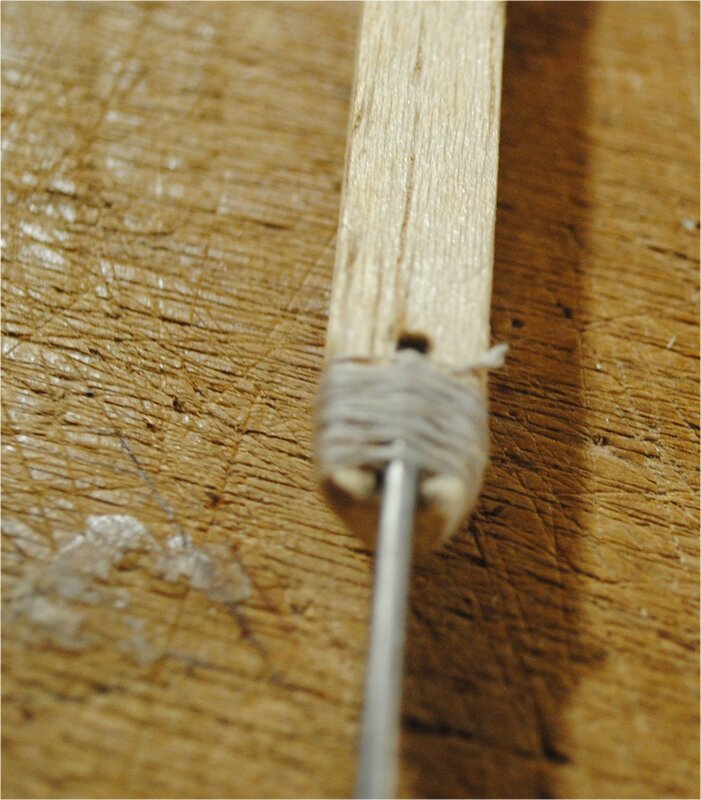 A wooden push rod is just a stick of balsa wood or a dowel, with a wire at the front end for servo attachment, and a wire at the aft end for control surface attachment. 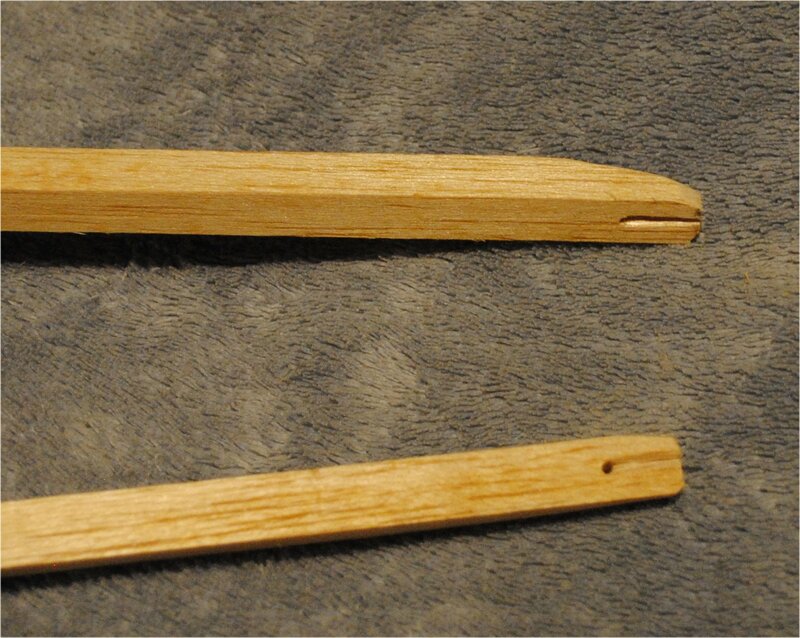 Wooden push rods originated in the olden days of aeromodeling. A lot of builders would never consider using them in these modern, enlightened times because they just seem so Neanderthal when compared to the sleek tube-type push rods that you buy at the hobby store. 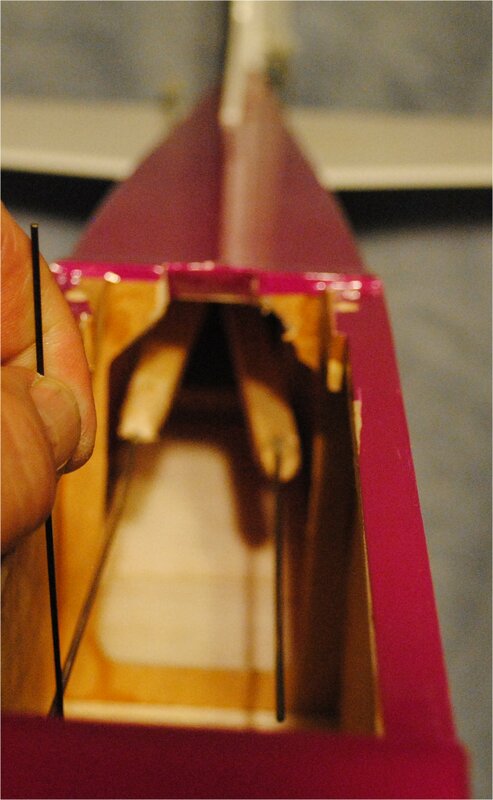 The wooden part should be thick enough, and of course hard enough, to make the push rod stiff, so as to avoid sloppy control surface operation. So don’t use soft balsa for a push rod. A wooden push rod will probably never be as precise as a well installed tube-type push rod, but that’s OK because they have their place. Sport planes, trainers, old timers, and some scale planes will do very well with wooden push rods. In fact I’ve even built pattern planes with them, but I’m not a serious pattern flier. For just having some fun wooden push rods are a good choice. 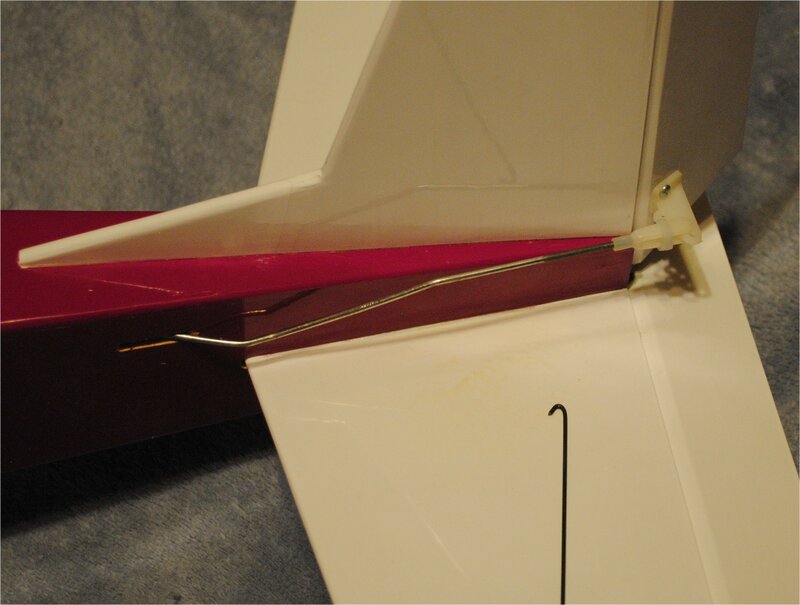 When installing wooden push rods you will need a relatively spacious fuselage aft section so the two sticks can coexist without rubbing each other. It helps to put one push rod exit higher than the other to avoid interference. If you can do that, sometimes you can even have the push rods cross each other without touching, which can help if you are trying to keep them as straight as possible. You should figure this out first, so you don’t have to make a mistake later and then figure out how to fix it. Once you get your plan settled, you can go ahead and cover and finish the fuselage, attach your tail, etc, and cut exit slots. Or if you prefer, cut the exit slots before covering. Either way you do it, once you have the fuselage covered and the exit slots are cut out, it’s time to make and shape your push rods. First, figure out how long the aft wire needs to be in order to operate the control smoothly. If there’s a bulkhead in there, you don’t want the back end of the stick bumping into it. 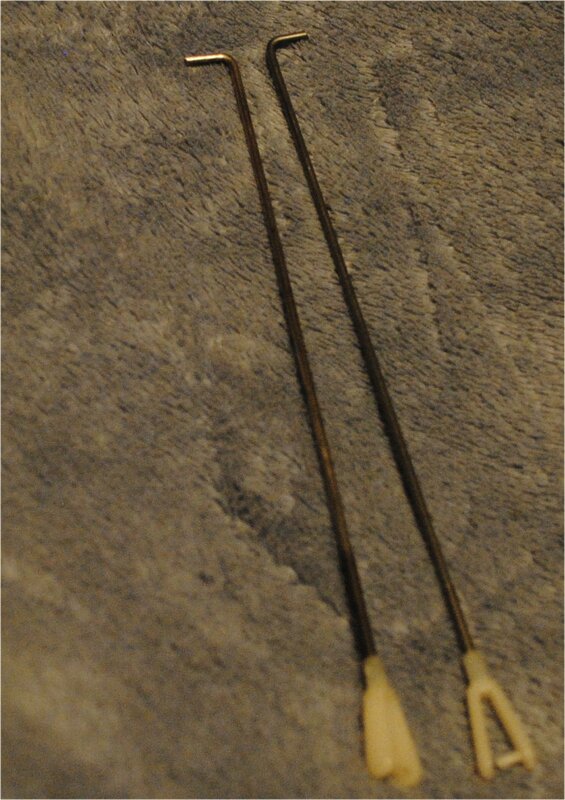 So make sure your stick ends in a good place, and use steel wire from there to the control horn. Thunder Tiger 15H trainer from the 1980s. I’m using a 3/8″ square balsa stick for the push rod. The stick shouldn’t reach all the way back to the push rod exit slot. Getting an idea of how long the wire needs to be. Cut your steel wire to length and make a 90 degree bend in the end about a quarter inch long. 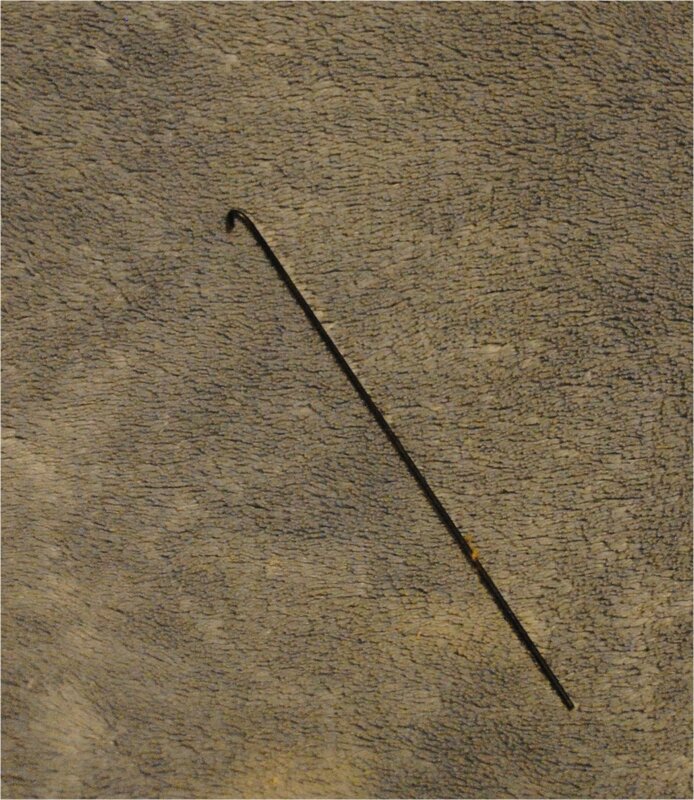 Drill a hole through your stick about half an inch from the end, and make a slot along one side from the hole to the end of the stick. To make the end of the push rod less likely to bump into things, it may be a good idea to taper the end. Put the wire in the slot with the bent portion in the hole, and bind the wire to the stick with sewing thread. Make it permanent with your glue of choice. You could use Titebond, CA, epoxy, polyurethane, or whatever you think will hold the thread in place. Please note that these photographs show push rods for a smallish plane. 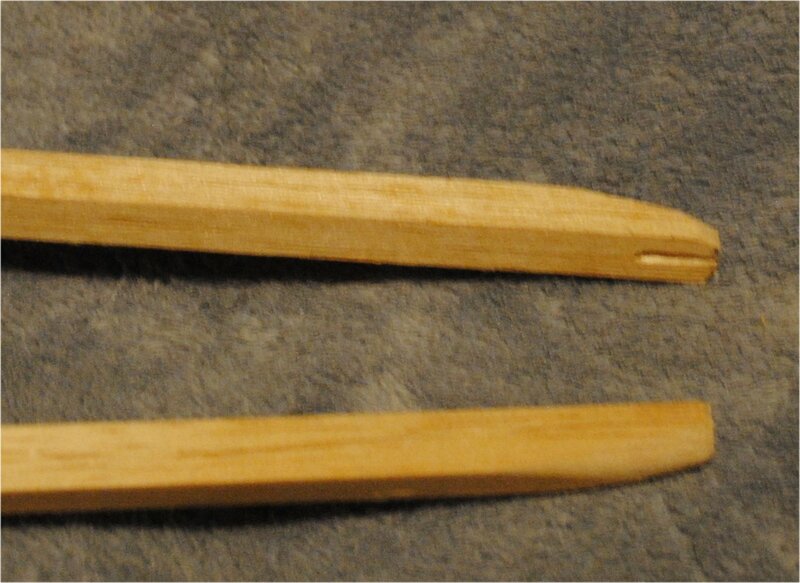 Wooden push rods are a good choice for larger planes, but the wire should overlap the wood an inch or two for more strength. Follow the same procedure to attach the wire to the front of the stick for connecting to the servo. You should have previously gotten a good idea of where your servos need to be for proper balance, so you can make the front wire the correct length. If you aren’t sure, you can use an extra long wire and trim it to the correct length later. When you are attaching your wires to the stick, remember that the stick is supposed to be the stiff part of this assembly. Steel wire can allow a lot of side flex if it represents too high of a percentage of the total length of the push rod. So make the wooden part as long as you can without it bumping into things. When you have the servos in place and the control horns installed, it’s time to do a little bit of bending on the aft end of the push rod where it exits the fuselage. It’s OK to put a few bends in the wire, but try not to get carried away. Straighter is better. Also, make sure you don’t hang onto the wooden stick with one hand while trying to bend the wire with the other. This will loosen the joint. Hold onto the wire itself with pliers and bend the wire with your other hand. Remember, if you’re not holding onto the wood at all, you can’t strain the joint. This is the correct way to bend wire on a push rod. 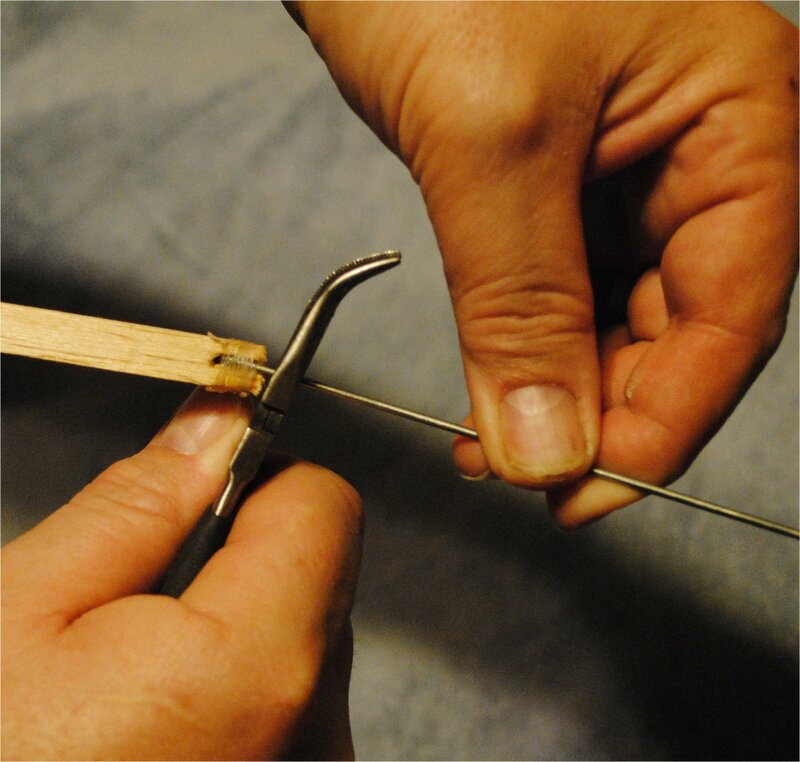 Avoid breaking the joint between the wood and the wire by not holding onto the wood while you bend. Lay the push rod on top of the fuselage, or if it’s more convenient turn the plane over and lay the push rod on the bottom of the fuselage. Bend the wires if necessary to get the stick away from obstructions, allow the wire to pass through the exit slot, and line the clevis up with the the control horn. The elevator push rod looks like it should line up. It didn’t take much bending at all. Once you get it figured out, repeat the process with the other push rod. 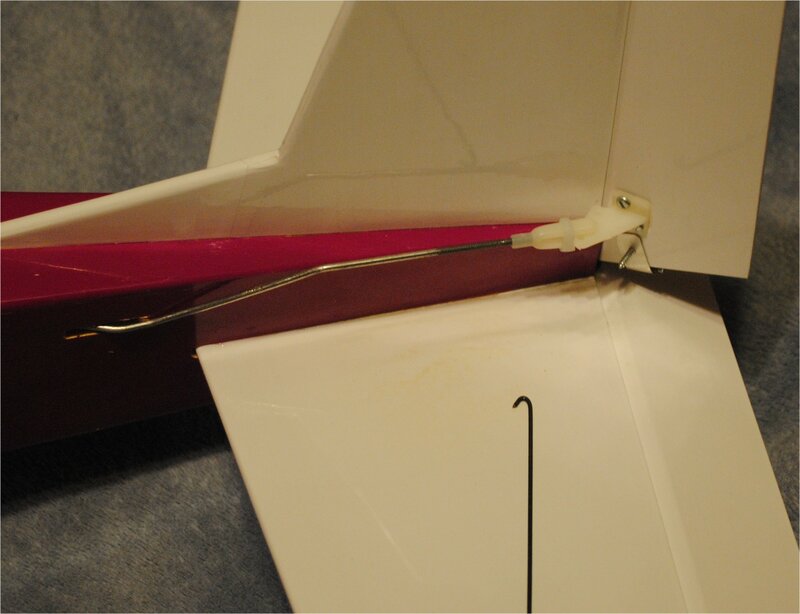 The rudder push rod required a lot more bending. One bend to get it through the slot, another to make it go up to the control horn. The next thing to do is to install the push rods in the fuselage. This can be a bit tricky, especially if your plane has a small radio compartment opening or a particularly long, narrow fuselage. I find that removing the clevis can ease installation. 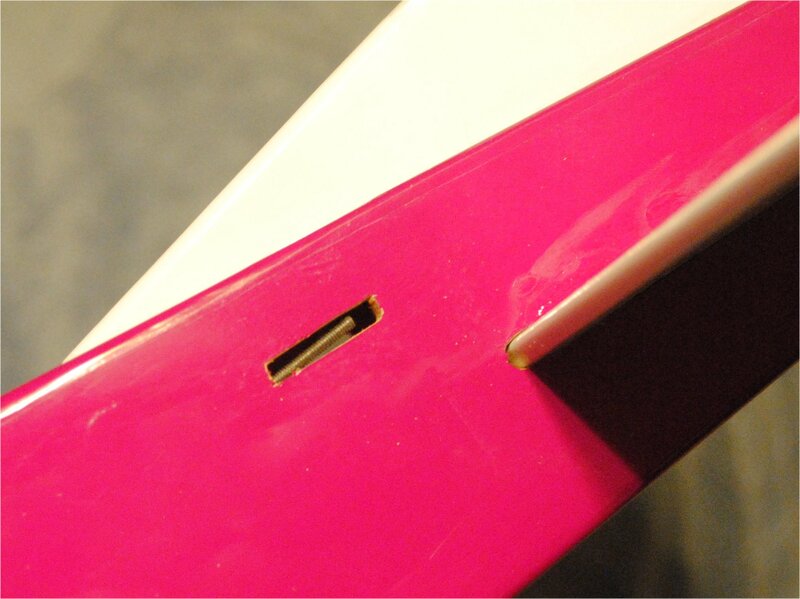 Push the rod into the plane and watch for it through the slot. Sometimes you can twist the rod around a little bit and make the end come through the slot. Lucky break! This push rod went right to the hole. Sometimes the best you can do is get it even with the slot and fish it out with a wire hook. Sometimes it gets really difficult to put the second one in because the first one is in your way. This can be frustrating, but don’t worry, you’ll get it sooner or later. I had to use this hook to get my second rod to come out. Sometimes you will find that no matter which way you bend the wires the two push rods interfere with each other. If this is a problem, you could build either push rod with the stick above the wire, below the wire, or to one side or the other of the wire. Do it whichever way you need to in order to achieve free, unrestricted motion and to prevent interference with the other push rod. 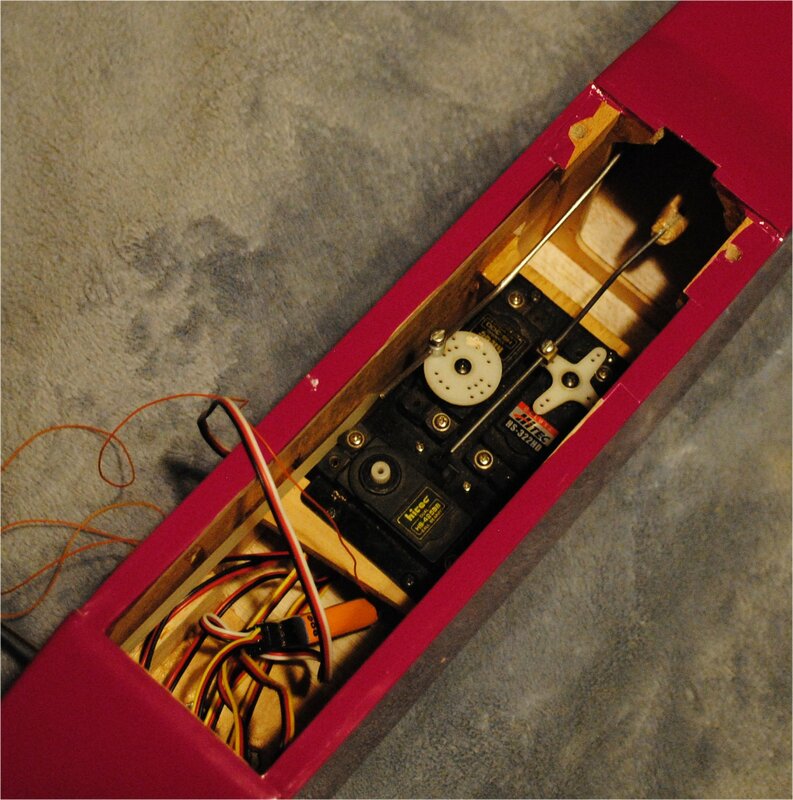 On this particular project, the rudder stick is on top of the wires and the elevator stick is below the wires. I did it this way to allow the sticks to cross so less bending is required. You can see the crossed sticks with the rudder stick on top. As it enters the radio compartment it slants down then flattens at servo level. Once you have the rods installed, check for proper motion without binding. Here’s the rudder all the way to the right. And here’s the rudder all the way to the left. Watch where the rod exits through the slot and be sure that it doesn’t bind. Here is the finished installation at the tail as seen from above. Obviously this is just a goofy trainer kit with both wires on top in full view. The push rod exit slots were pre-cut at the factory. If you want a better looking plane you can put your rods under the tail. 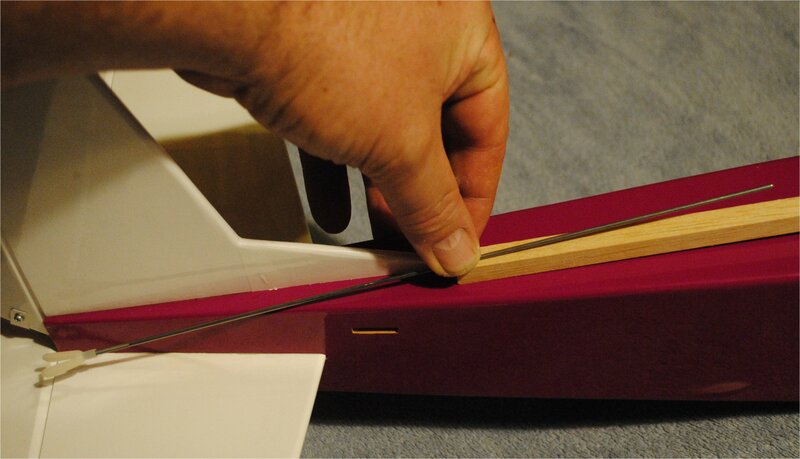 At minimum, what I should have done in this case is cut a new rudder exit slot in the top of the fuselage. That way, instead of the rod bending to the side and then up, it would have just gone up. Here’s the finished installation in the radio compartment. Well, it’s not exactly finished because I haven’t put the throttle cable in yet. But the rudder and elevator rods are finished. Probably the best thing about wooden push rods is that they don’t require much planning. You can put your servo and control horn just about anywhere you want, and build a wooden push rod in whatever shape it takes to connect them. The only time it gets difficult is if your fuselage is super narrow and there just isn’t room for sticks inside it. In case you’re interested in a performance report, I flew this plane a couple of times. It’s a Thunder Tiger 15H trainer kit that I bought online. It was obviously very old, probably from the 1980s. It has a flat bottom airfoil and no ailerons and a very conservative engine recommendation from 10 to 15 size. 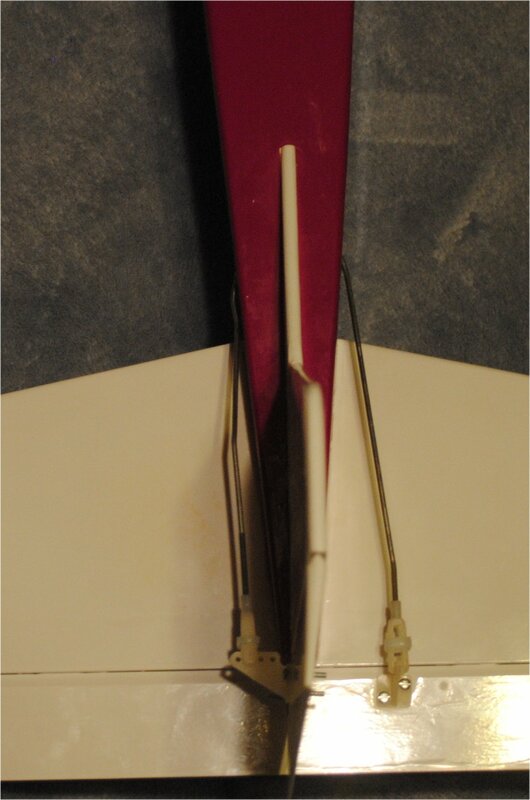 I fully sheeted the wings on top and bottom with 1/16″ balsa, added flat sheet-stock ailerons, and put an OS 25 FP in the nose. This plane really tears up the sky, and the wooden push rods perform flawlessly. I really couldn’t ask for any better control response.